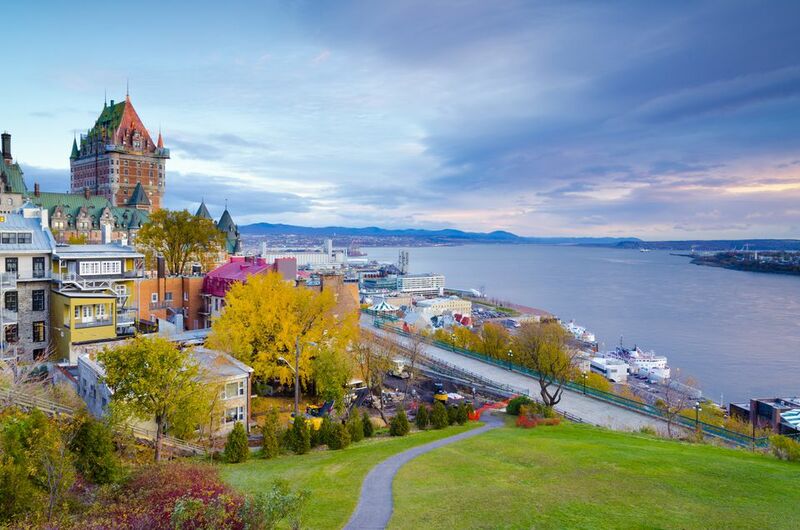 Nestled in the hills along the St. Lawrence River, Québec's capital city also sports a UNESCO World Heritage designation and one of the finest old city sections, Old Québec, on this side of the Atlantic. Québec City offers much to a traveler, but it pays to study some of the ways money can be saved during your visit. Take a look at some budget travel notes about Québec City. This beautiful capital city bills itself as "Europe without the jet lag." Here you walk through neighborhoods that give the feel of a preserved old town in France but pay a fraction of the travel costs. Québec City is about 2.5 hours by train from Montreal, and within a few hours of flying time from New York, Philadelphia, Boston, Chicago, and other major U.S. airports. The city hosts a popular winter carnival, but don't show up during that season unless you're a big fan of snow and cold. Québec City receives an average of about 10 feet of snow each year. Annual snowfall amounts approaching 20 feet are not unprecedented. Summer months are pleasant and popular, so you should expect lines and perhaps some "no vacancy" signs at that time. Fall might be the best season of all—brilliant leaf colors and comfortably cool temperatures are the norm. The word Québec means "place where the river narrows," and one sweeping view of the St. Lawrence from the city's boardwalk will make that observation plain to you. High-rises mark the financial center of the city, but a walled Old Québec (Vieux-Québec in French) sits between that modern downtown and the river. In fact, these are the only fortified walls north of Mexico that still exist on the North American continent. A wide expanse known as the Plains of Abraham is now a city park and hosts major outdoor concerts. But it is known to historians as the famous battleground where the British defeated the French and took control of Canada in 1759. Québec City is a prime location for a summer budget travel picnic. You'll find freshly baked bread, cheese, or ready-made sandwiches available for purchase, and there are nice places to settle in and enjoy the views. Restaurants along Rue Saint-Jean cater to tourists, but prices and values are not unreasonable. Two nice splurge restaurants are Cafe Ciccio (about two blocks uphill from Saint-Jean on Rue de Claire-Fontaine) and Crêperie-bistro Le Billig (on Saint-Jean near the corner of Rue Scott). Both serve delicious meals for around $20 CAD/person. Old Québec is compact and easy to cover on foot. But you'll either need a car rental or some knowledge of mass transit for visiting Montmorency Falls or Ile D'Orleans. It is possible to take bus no. 800 to the falls for $2 CAD. Cab rides to the airport can be pricey, because Jean Lesage International Airport is located on the far edge of the city. The VIA rail station is in the heart of the central city, within blocks of the top tourist areas. Several major chain hotels tower over the edges of the walled city. In places such as the Palace Royal, you'll receive four-star treatment and enjoy outstanding views at prices in the $150-$200 CAD range. For those needing more affordable rooms, it's possible to stay very close to the historic sites in a small two-star or three-star establishment for under $100/night. Montmorency Falls is a short drive from the city and a popular excursion for Québec City visitors. The height of the falls is greater than Niagara, and there are a variety of ways to observe it. For the hearty, there are stairways that will take you to an observation platform. There is also a cable car option. The falls is visible from Ile d'Orleans, a large island in the St. Lawrence that is home to huge country estates, wineries, farms and orchards. There's only one bridge to the island, and the traffic back-ups during the fall foliage season can be significant. Plan on seeing the changing of the guard at La Citadelle de Québec. The impressive ceremony takes place daily at 10 a.m. from June 24 until the first Monday in September. Loosely based on the ceremony at Buckingham Palace in London, this ritual has been observed since 1928, with a hiatus during the World War II years. It takes about 35 minutes and is included with admission to the Citadelle, ($16 CAD) which is well worth your investment of time and money as you explore the old city. Get the Québec City Discount Passport. Build your own city pass online with three to 10 activities, and save on admission costs. The pass is also good for free ferry rides across the St. Lawrence. Speaking of the ferry, the boats make frequent round-trips between the old city and the city of Levis, across the river. The 10-minute ride is relaxing after several hours of walking, and it affords great photo opportunities. If you don't use the passport, a round-trip ticket costs about $7 CAD. Set aside time to browse the artist alleys. As you stroll through Old Québec, you'll find several places where artists are selling their original works. Some are willing to talk about their techniques and their routine as an artist. You'll meet older masters and college art students. It's a nice diversion, and you might pick up a souvenir of your visit. Battlefields Park is a great free attraction. Also known to historians as the Plains of Abraham, it was here that the British and the French fought in 1759 for control of the region. If you're not a historian, you'll still enjoy what this area has become -- a beautiful city park not unlike Hyde Park London or Central Park New York. Le Festival d'ete de Québec is a summer concert series typically conducted in July. Outdoor stages are set up at strategic points throughout the city. Some of the events are free of charge.